The sniping between President Donald Trump and JPMorgan Chase CEO Jamie Dimon over their intelligence levels marks a new low in what has been an on-again-off-again relationship. Though they're at odds now, less than two years ago Trump advisers reportedly floated Dimon's name as a potential presidential cabinet nominee. In turn, Dimon last year stood by Trump and faced down JPMorgan shareholders who asked if he would step down from a White House business advisory council. Dimon triggered the most recent souring in the relationship during a Wednesday event at JPMorgan headquarters in New York City by stating: "I think I could beat Trump." "Because I'm as tough as he is, I'm smarter than he is," Dimon said. "I would be fine. He could punch me all he wants, it wouldn't work with me. I'd fight right back." But Dimon, a 62-year-old career banker who underwent successful treatment for throat cancer in 2014, quickly backtracked on his brash statement. "I should not have said it. I'm not running for president," said Dimon, who added that his unexpected remarks proved that "I wouldn't make a good politician ... I get frustrated because I want all sides to come together to help solve big problems." Trump mocked Dimon via Twitter on Thursday morning, while at the White House monitoring preparations for Hurricane Florence as the massive storm neared the Atlantic coast of North Carolina and South Carolina. Trump, 72, declared that Dimon "doesn't have the aptitude or smarts" to run for president and is a bad public speaker, as well as a "nervous mess." Days after Trump won the White House by beating former Secretary of State Hillary Clinton in November 2016, advisers to the president-elect raised the idea that Dimon might be nominated for treasury secretary, CNBC reported. 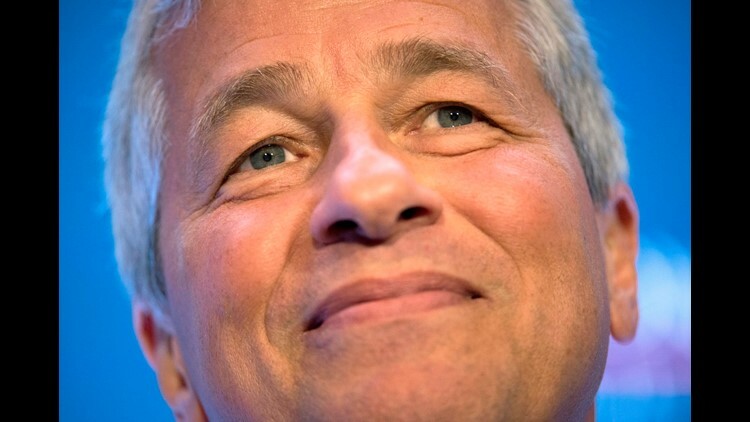 Dimon said he wasn't interested in the job. Trump's Treasury nominee proved to be Steven Mnuchin, the former Goldman Sachs investment banker, hedge fund manager and film producer who served as the national finance chairman for the victorious presidential campaign. Nonetheless, Dimon and Trump maintained relatively cordial relations until this week's dust-up. The former real estate developer and reality-TV-star turned president even named the bank CEO to a presidential business advisory council. In May 2017, Dimon told investors at JPMorgan's annual shareholder meeting that he would not step down from the panel despite mounting criticism of the White House administration. "He is the president of the United States," Dimon said during the session at JPMorgan's technology center in Wilmington, Delaware. "I believe he's the pilot flying our airplane. We're trying to help. I would try to help any president of the United States because I'm a patriot. We do not – it does not mean we agree with all the policies that the administration comes up with." That final comment proved to be prescient. Trump sparked national criticism in August 2017 when he suggested that left-wing groups had been just as violent as the white supremacists who staged a demonstration in Charlottesville, Virginia. A stream of CEOs signaled their protest by resigning from a presidential business advisory council. The panel ultimately disbanded, with Trump saying he ordered the break-up. Dimon's response to the controversy was carefully measured. Instead of joining the angry resignations, he made his views known through a note to JPMorgan employees that quickly became public. "I strongly disagree with President Trump's reaction to the events that took place in Charlottesville over the past several days. Racism, intolerance and violence are always wrong," Dimon wrote in a note to JPMorgan employees that was reported by several media organizations. Dimon's note also said that the members of Trump's strategic and policy forum had "agreed to disband," a decision he supported. In his annual letter to JPMorgan shareholders in April 2018, Dimon praised the Trump-driven federal tax reform that took effect this year. The package lowered taxes on businesses, enabling them to fund share buybacks and dividends. "Tax reform’s real benefit will be the long-term cumulative effect of retained and reinvested capital in the United States, which means more companies, innovation and employment will stay in this country," Dimon wrote. Referring to Trump's recent efforts to scrap or rewrite trade agreements with other nations because the deals disadvantaged the U.S., Dimon wrote: "It is not unreasonable for the United States to press ahead for more equivalency." For all their differences, Trump and Dimon have at least a few similarities. Trump currently ranks 248th on the Forbes 400 list of the wealthiest Americans, with an estimated net worth of $3.1 billion. Dimon's current estimated net worth is $1.4 billion, below the level needed to make the Forbes 400 list. Before joining the real estate business founded by his father, Trump graduated from The Wharton School of the University of Pennsylvania, a highly selective business training program. Dimon graduated from the Harvard Business School, where he was named a Baker Scholar, an award for the top students. Will Trump and Dimon patch up their relationship? Will they clash again? To be continued.